The fun is in the shaving, and cheering, at the St. Baldrick's fund-raiser. The 2017 event is planned Saturday at the Eagle Fire Station. What: Head-shaving in a festival atmosphere to benefit the St. Baldrick’s Foundation. When: 11 a.m. to 3 p.m. Saturday, March 10. Where: Eagle Fire Station, 425 E. Third St. in Eagle. EAGLE — Lt. Jake Best, of the Greater Eagle Fire Department, acknowledges he prefers to have hair on his head, but on Saturday, March 10, he will gladly shave it all off for the department’s annual St. Baldrick’s benefit. “It’s a great thing to show that solidarity with kids who are going through a hard time,” Best said. Saturday marks the Eagle firefighters’ 13th annual St. Baldrick’s event. 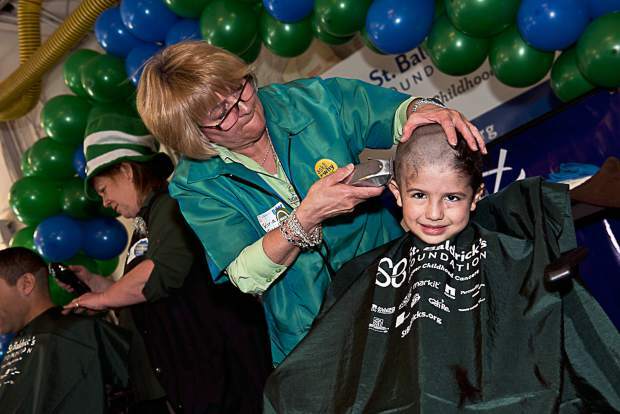 The St. Baldrick’s Foundation, a volunteer-powered organization dedicated to raising money for children’s cancer research, hosts signature head-shaving events nationwide in March. In the past 12 years, the Eagle event alone has raised more than $500,000. Best is one of a crew of locals who has participated in all 12 events. He noted shavees traditionally try to grow out their hair, both on top of their heads and on their faces, in anticipation of the shave-a-thon. Then in a festival atmosphere at the fire station, they each take a seat at one of a number of chairs set up on a stage and submit themselves to electric-razor-wielding barbers. Typically, as many as 100 volunteers are shaved, and each of them collects pledges ahead of time. An auctioneer on duty during the event also cajoles the crowd to donate to the effort. For those who enjoy a party, are willing to donate and who don’t want to part with their tresses, the event also features a silent auction where dozens of items donated by local businesses are offered. As a longtime St. Baldrick’s participant, Best will be one of the members of the Knights of the Bald Table — a celebration of volunteers who have shaved their heads for at least seven past years. For all the hilarity that’s part of a St. Baldrick’s benefit, some sobering statistics prompted the nationwide effort. Every two minutes, a child is diagnosed with cancer, one in five won’t survive, and those who do often suffer long-term effects from treatments too harsh for their developing bodies. From its beginning, St. Baldrick’s has believed that kids deserve the chance to be kids — fun-loving, carefree, refreshingly honest and always a little goofy — and deserve the chance at a future. Donations raised at shave-a-thon events have made it possible for St. Baldrick’s to fund more than $200 million to support the development of childhood cancer treatments that are as unique as every kid. Since its inception fewer than two decades ago, the St. Baldrick’s Foundation has become the largest private contributor of childhood cancer research grants. The Greater Eagle Fire Department relishes its role in promoting the St. Baldrick’s message and work. While the local benefit attracts a large EMS and law enforcement contingent, the effort welcomes anyone interested in helping. Register to shave at http://www.stbaldricks.org, and search “Greater Eagle Fire Department,” or come out on Saturday to make a donation or purchase a silent auction item. It will be a fun afternoon, and that’s the bald truth.